According to Goodreads, it took me almost a month to read Patina. It felt way longer than that! I read Jason Reynolds' first book in the series, Ghost, in a day, so I was shocked that I dragged my feet on this one. I think it would have gone faster if I had a physical copy, rather than reading it on my phone, but that hasn't stopped me from tearing through other books. 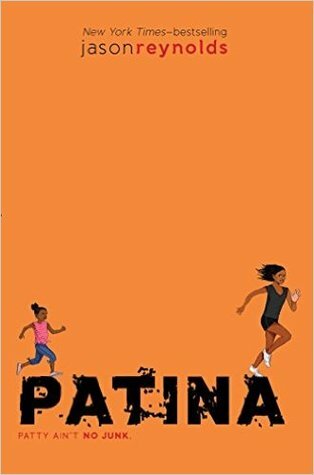 Patty is on the same track team as Ghost and she has a lot of issues in her life: a school where she doesn't fit in, a sick mother who can't take care of her, the responsibility of a little sister hanging over her head. On the other hand, she has a lot of blessings like a track team who accepts her, an aunt and uncle who are raising her, and the opportunity to attend a great school. I liked the balance in the book, that there are two sides to every drama. It's up to Patty to decide how she wants to see her situation. Patina didn't click for me, but I think it will for many readers. I am eager to read the third book in the series, Sunny, and see if I like it as much as Ghost, or if it falls closer to Patina for me.